Coleraine's Darren McCauley could be set for a return to Derry City. IN-DEMAND winger, Darren McCauley insists he would consider a return to Derry City should he decide to move away from Coleraine during the January transfer window. 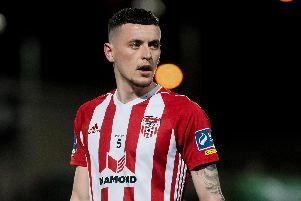 The former Celtic trainee has six months remaining on his current deal with the Bannsiders and Derry City boss, Declan Devine has made no secret of his desire to bring him back to the Brandywell. However, the Candy Stripes face stiff competition with big-spending Bluefin Championship leaders, Larne among several clubs vying for his signature while Coleraine boss, Rodney McAree is hopeful the player, who netted 20 times last season, will sign a new deal. The 27 year-old Top of the Hill native is determined to return to full-time football and claims he will always have ‘an affinity’ with his hometown club. “I’m just weighing up my options at the minute,” said McCauley. “Derry City is my hometown team and I have an affinity with the club and the city. So it’s something I definitely have to consider. “But it has to be right for me from a football point of view,” he added. “I’m ready to go full-time. If the offer is there it’s something I have to consider. “There are options north and south of the border but, for me, the opportunity to go full-time and fulfil my potential as a player is my main ambition. Ex-Celtic winger, Paddy McCourt, who was at Parkhead when McCauley signed for the Hoops from Derry in 2010, could also help seal the deal for the Candy Stripes. Indeed, McCauley claims McCourt’s advice would be ‘invaluable’ should he decide to join the club. “I’m not going to lie, it’s a big draw. The fact the manager and backroom staff are all from the town I feel I can relate to their views and how they see football. “Obviously Paddy was a fantastic player and played in a similar position to what I’m playing now so his advice would be invaluable. Decky coached me as a kid from I was 12 years old so I know him quite well too.